The Senators’ owners decided to move the franchise to St. Louis, Missouri, and the transfer was approved by the league on May 14, 1934. Thomas Franklin Ahearn resigned as president of the Ottawa Auditorium and Redmond Quain became president. Quain transferred the players’ contracts and franchise operations to a new company called the Hockey Association of St. Louis, Inc. Eddie Gerard was hired to coach the new team. The club was renamed the Eagles, inspired by the logo of the Anheuser-Busch brewing company, which was founded in St. Louis. 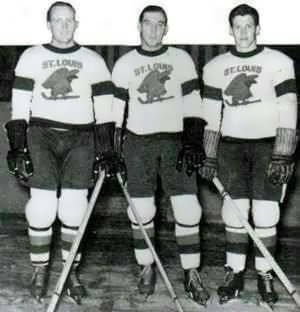 The Senators name and logo remained in Ottawa and would be used by a senior amateur team until 1954. At the time, St. Louis was the seventh largest city in the United States, with over 800,000 inhabitants over seven times larger than Ottawa. Despite this, St. Louis had been denied an NHL franchise in 1932 because travel to the Midwest was considered too expensive during the Great Depression.